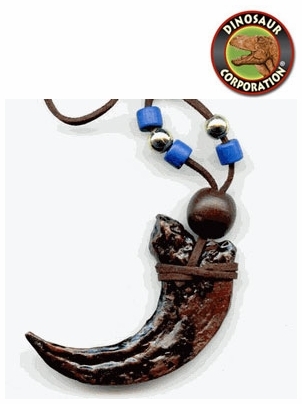 Inspired by Jurassic World, this dinosaur necklace features a ferocious Velociraptor killer claw on leather neck cord. A perfect dinosaur gift for prehistoric enthusiasts. We reserve the right to cancel any order due to unauthorized, altered, or ineligible use of a discount. Velociraptor is a genus of dromaeosaurid theropod dinosaur that lived approximately 75 to 71 million years ago during the later part of the Cretaceous Period. Velociraptor was no bigger than a wolf and with its feathers it bore a very bird-like appearance that would make it all the more different from the films, being more akin to a flightless hawk. It had a long claw ("terrible claw") on the second toe of both feet, 8 cm (3 in) long, which was probably used as a weapon, plunging into the flesh of victims and causing deep wounds.